LX started the game with several periods of good play and although controlling the game were given an early wake up call by an Alliance break which resulted in a short corner. Martin Ferret saved the shot which was then cleared by Brian Stokes. The pace of the game was increased by LX and they won a short corner of their own. Although this didn’t go exactly to plan Roger Girling collected the loose ball and scored from a well directed shot inside the left post. From the restart LX continued to press and won another short corner which was well converted by Captain David Ewing, making the half time score 2-0. During the match there were continual cries of “come on Grandad” which lifted the whole team but was specifically aimed at John Grinham who was playing well in front of his family. This was a good start for the opening game of the tournament LX 4 – Alliance 0. LX lost Tim Block for the rest of the tournament as a result of a ‘warm up’ injury but despite this setback LX began in confident mood against a solid and determined South Africa team. Inspired by a mobile and destructive defence, LX began constructing some good flowing hockey, Hutley and Robertson combining well with Lucas and Stokes and setting up the pace of Sheridan on the flanks. From one incisive move down the right, Lucas gave a fine early pass to Harris who confidently converted to give LX an early goal. More pressure in the second quarter led to a second goal from a penalty corner. A fine shot from Bolina, well saved by the South African keeper, led to Grinham scoring from close range from the rebound. In the second half, LX began to apply much more pressure and indeed seemed to be playing with 12 men on the pitch! More penalty corners followed and one led to the elusive Girling scoring with a reverse flick past the keeper. Lucas and Sheridan were now rampant on the right, well supported by Kemble creating further opportunities. Girling had a shot deflected over the bar and Singh went close when well set. The best move of the game that went across the midfield and down the right led to Lucas crashing home the fourth goal. Finally Harris converted a penalty flick to give LX a satisfying 5-0 win. LX started with an effective press on Germany with only their right wing, Terry, and centre forward, Pieter, furthest up on the halfway line. LX showed good passing skills with reasonable pace in the midfield and up front with overlapping play from the back throughout the game. Despite the inevitable stick infringements from the German team which the umpires apparently considered fairplay, LX pressed home their territorial advantage through an opening goal from Oz Harris. LX Red maintained their team dominance and by halftime were two up with a goal from Brian Hopkins. On the whole LX Red found self-discipline in the face of some strange European umpiring from umpires with almost audible police whistles which they "had not been trained to use"! Above all LX Red kept their shape with pressure on the Germans. In a lull the team and supporters spirits were raised when all witnessed a Brian Hopkins special from the edge of the circle with the goalie, out of position off his line, watching as the ball was neatly deposited over his head into the side netting. 3-0, a good cushion. In the final quarter under instructions from the manager merely to hold our shape and keep possession the team seemed to know better than to conserve energy as had been called for. The resultant pressure led to a Watson penalty corner strike trapping their left back, who conceded a Penalty Stroke, as the ball hit him on the body after his upward deflection. T his was duly put away from the spot by Pami. Overall a good performance from a squad of only 15, without the services this time of Martin, Phil and sadly Tim, out through injury. In a robust encounter with the Australian guests England LX overcame stubborn resistance to retain the "Ashes Trophy", first awarded in the 2004 Tournament Trophy event. More importantly it maintained the team's undefeated status and secured 3 more points. LX started the game in a rather hesitant manner and allowed the opposition too much time and room and therefore experienced some pressure on the defence. However, well marshalled by the vocal encouragement of Eric Best in goal and skipper, David Ewing, the team gradually regained its confidence and composure to take control of the match. LX dug in and applied pressure on the Australians. They responded aggressively, with Brian Hopkins being the victim of a particularly violent assault from behind which resulted in the 1st card of the game, albeit a rather lame green. The pattern was now set, a further 5 cards followed during the rest of the match. LX eventually settled into the high pressure game that epitomised the team effort throughout the tournament, with the vigorous defence and harassing high press from the forwards and midfield. Increasingly, the Aussies were forced into making errors. This pressure resulted in the LX scoring the first goal when David Sheridan opportunistically netted just before half-time. Following the break LX resumed control, keeping the ball moving and retaining possession well, further frustrating the opponents. When Southern Cross had the ball they were not allowed to settle and their defence was harried at every opportunity by an increasingly confident whole team "press" from LX, especially the forwards. This led to further good scoring chances and Pami Bolina converted one, allowing LX the opportunity to ease back and confidently conclude the match well in the ascendency. Despite the challenging nature of the game all players adjourned to the Cherwell Boathouse for a beer and for the Aussies to lick their wounds and the LX to prepare for further tough encounters. LX began their penultimate game knowing that a win would be required to maintain their two point advantage over final game opponents, the Netherlands. Captain David Ewing had cautioned his side that the Welsh would be highly motivated and this proved to be the case. Their hard working midfield and mobile forwards caused the normally solid LX defence significant problems throughout the first quarter. During the break, Manager Mike Patton and David Ewing underlined some priorities for play in the second quarter. The team responded and gradually asserted greater control. Several open play chances and short corner opportunities, however, failed to produce a goal. The third quarter followed the pattern of the second with LX having greater possession and the Welsh continuing to create breakaway chances. The breakthrough came when an LX corner routine resulted in Dave Sheridan scoring from close range after good work by John Grinham driving in to the circle and crossing from the right. The Welsh responded well to this setback and it required a game saving goal line stick save from Chris Perry to keep LX ahead. The final quarter saw LX being forced to work hard to maintain possession and keep the Welsh at bay. The 1-0 victory was secured through a determined whole squad effort and was undoubtedly the most challenging encounter to date. During the warm down the squad received confirmation that the Germans had held the Dutch to a 3-3 draw. Having already drawn against Southern Cross the Dutch were now four points adrift of LX leaving LX with an unassailable position for the Trophy and Gold medals. With the Gold medal already won this game was somewhat anticlimactic. However, the Dutch exchanged pennants and pins and congratulated LX on their tournament success. However, they declared their aims to score the first goal of the tournament against LX and to secure points to win the Silver medal. The first four minutes suggested that there was a physical, as well as a skilful game to follow. LX created early pressure and after six minutes Pami Bolina worked a short corner but no goal was forthcoming. Two more short corners followed in quick succession without success. There followed a period of midfield play with neither side looking dangerous but just before quarter time the Dutch forced a short corner and Rob Boon scored from a routine that went wrong. The Dutch continued strongly but soon LX regained the upper hand we were awarded a short corner. The practiced routine went amiss again but a follow up by Paj Singh put the ball in the back of the net for a 1 – 1 score at half time. LX started the second half very strongly with good passing and supportive movement off the ball. A series of excellent short passes gave John Grinham a chance to put LX 2-1 ahead. A midfield battle followed with LX looking much the better side with lots of miles covered by David Sheridan and Brian Hopkins. The touchline supporters wondered what David Ewing had said at half time to inspire the change. The last ten minutes saw the Dutch take a degree of control, strengthening their attack and moving the ball quickly and accurately. LX were forced into a risky strategy of trying to play out the game, but a fine move by the Dutch just 2 ½ minutes from the final whistle saw the scores levelled at 2-2. After the final game a gift was presented to Trish Slator who had acted as medic for the team. The dominant success of the LX team in the tournament was down to good planning, strong leadership, solid defending based on a high press and closing down of the opposition all over the pitch and good supportive movement off the ball. The commitment of players was first class and the team spirit exceptional. Both sides looked a little jaded as they took on their sixth match in nine days for the TT065 Gold medal. As expected LX Red had much of the midfield play and hit a post early on . But the LX White Goalkeeper stood firm when LX Red pressed and the LX Red defence was troubled by LX White pace , through Rod Cochrane, as they broke quickly from mid field . This caused a couple of scrambles in the LX red circle , but Kimber was alert in goal. However it was 0-0 at Half time . In the second half LX red took complete control as LX White tired. Adrian Stephenson pushed the ball into an empty net ,after a fine move, to open LX Red’s account . The second came soon after when LX red’s regular practice at penalty corners finally paid off with a very well worked manoeuvre from which Stephenson scored his second. Pickersgill remained solid in defence for LX Red and Sudesh Nayar brought calmness to the centre half position with some astute passes. LX Red :- team:- Kimber, Danson, Pickersgill, Lomax ( capt. ), Read, Clarke, Harris, Hayes, Purshouse, Thompson, Stephenson, Ridings, Nayar, Blackmore. LX RED sneaked into Friday’s final through superior goal difference after this close fought match against a Southern Cross side who gave ‘the Reds’ a real test. Southern Cross caused problems early on as LX red took a little while to find their passing game after the difficult match with the Dutch the day before . However a penalty stroke conversion by Centre forward David Thompson, because of a stick tackle in the circle, put LX Red in front. LX Red dominated the rest of the half and created further chances but could not take them. Southern Cross battled back but their burly right winger ,who had been ‘enjoying ‘ a vigorous contest with LX left half David Read ,earned a spell in the sin bin. In the second half Southern Cross were not to be denied , and after concerted pressure , scored with a fine reverse stick strike high into the LX Red net to ensure honours were even at the finish. Team; Kimber, Read, Blackmore, Lomas ( capt), Ridings, Harris, Spencer Knott, Hayes, Purshouse, Stephenson, Thompson, Nayar , Danson. LX RED will be disappointed that they didn’t make the most of their goal scoring opportunities from penalty corners and in open play against a tough well organised Dutch side with good basics and some pace up front. It is believed that LX Red will now need to win their final pool match to qualify for Friday’s final . Although LX Red were probably the better side overall The Dutch should have tucked away the winner from a penalty stroke near the end but Colin Kimber made the save. Early on LX Red’s best chance fell to Adrian Stephenson but he struck wide.The longer the game went on the more LX Red became frustrated and they didn’t switch the play effectively enough to stretch their doughty opponents. . For LX Red Richard Danson did well in defence and John Ridings added some pace to the midfield. Team :- Kimber, Read, Blackmore, Lomax ( capt), Danson, Clarke, Spencer Knott, Nayar , Purshouse, Thompson, Stephenson, Harris, Ridings. LX RED welcomed David Blackmore and John Ridings for their first appearances of the tournament and they contributed in a second clean sheet to be earned by a LX Red side gradually getting into their stride . LX Red again scored early goals on a baking hot afternoon , when the Coaching support sensibly substituted the 14 players at regular intervals to alleviate fatigue . A brace each for Adrian Stephenson and Mike Harris provided the fire power and Harris also earned the opposition’s man of the match award as he showed his versatility by operating both in attack and midfield at various times. Stephenson had put LX Red in front with an early strike after a flowing move down the right and then Harris again scored from a short corner rebound. As the team tired they did begin to lose the ball too often but eventually they got the message and also started to recycle play better and make the ball do the work. The Australians should have pulled a goal back when they had pressed on occasions down the right to earn a penalty corner which was saved by a leg on the line. However the resultant penalty stroke was badly missed. LX RED scored two further goals , one of which was from a sweeping move up field involving at least five players . Team:- Kimber, Read, Blackmore, Lomas, Ridings, Clarke, Spencer Knott, Nayar, Harris, Thompson, Stephenson, Hayes, Purshouse. After the disappointment of the first match loss LX RED needed a convincing performance to get their tournament on track. We welcomed David Read retuning from injury and Bill Pickersgill who travelled from Stockton on Tees for the day! 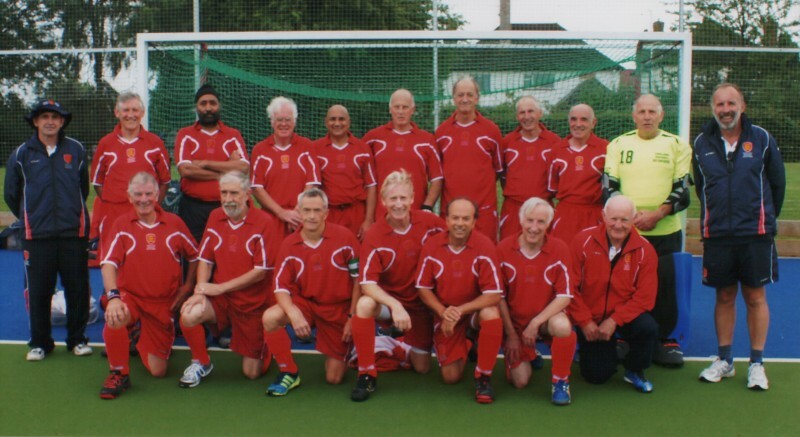 The team played some lovely quick passing hockey in the first quarter with the triumvirate of Read, Clarke and Purshouse regularly making inroads down the right with excellent support from Nigel Spencer Knott at centre half and the industry of Ted Hayes from left side of midfield. To settle the side a couple of early goals were scored and David Thompson, leading the line with aplomb , scored a hat trick with his final goal, being a classy affair. Although the team’s hockey was not as effective as the game progressed with a tendency to hold the ball or hit too long rather than the quick simple short pass Mike Harris scored his customary goal , tucking home a rebound from a Roger Lomas penalty corner. The other goals were scored by Stephenson and Purshouse. Colin Kimber in the LX RED goal did not have a shot to save as the Alliance rarely threatened. Team:- Kimber, Read ,Lomas ( capt. ), Pickersgill, Danson R , Clarke, Spencer Knott, Hayes, Purshouse, Thompson, Stephenson, Harris, Nayar. Day 1- Wed 15th August. Not a good start losing to the other LX team in the first game. We dominated the first three periods (we are playing 17.5 minute quarters) with the ball never reaching our circle. However despite all the possession and numerous short corners we could not find a way past a resolute defence. We only had a eleven players due to late injury problems and known availability issues. This began to tell in the fourth quarter as the White's began making inroads against a somewhat stretched defence and Colin Kimber was called on to make a great save to maintain parity. We conceded a short corner , the only one of the game , with 7 minutes to do go and a slipped ball well finished left us one down. We summoned what energy was left and strived for an equaliser and despite winning two more short corners it was not to be. Team:- Kimber, ,Lomas ( capt. ), , Danson R , Clarke, Spencer Knott, Hayes, Purshouse, Thompson, Stephenson, Harris, Nayar. The Final result ended a splendid tournament for LX Red, bouncing back from their first match defeat , and enduring other hard fought matches . The key to their success was only conceding two goals in the six matches and the defence of Kimber, Danson, Blackmore, Read, Lomas and Pickersgill should take much of the credit. However the midfielders worked progidiously throughout the tournament through Harris, Clarke, Hayes, Spencer Knott, Nayar and Ridings in addition to providing relief to the only three forwards - Purshouse, Thompson and Stephenson, who ran tirelessly and always posed a threat. Late injury call offs left the side short on numbers and special mention should be made of Bill Pickersgill who could not be away from home but who twice made the 450 mile round trip from Norton to provide much needed cover when we short. Also to David Blackmore who came into the side at short notice. Captain , Roger Lomas, should take real plaudits , for moulding a talented and spirited 15 man unit , if not all available for all games , into a successful team , particularly as he had to manage some strong personalities in the squad - including most of the organising committee!. All the team contributed to the organisation at Oxford and three nights out together helped develop the team spirit. It was extremely helpful to receive the diligent and constructive support from coaching and the management team of Mike Patton and John Longden , with assistantance from Andy Barnes and Mark Watson . Finally Sue Hayes led an enthusiastic ladies troupe in support, which was much appreciated by all squad members. A blockbuster opening to the 2012 World Cup was programmed, with LX Red pitted against LX White in the 65 Tournament Trophy. Although not exactly an epic of biblical proportions, it was undoubtedly a match that will go into LX folklore. It was a classic symphony of four movements (in hockey-speak known as 17 ½ minute quarters). The prelude had been played the week before, when most of the LX White squad had a gentle run-out against the 70 LX side. This was a mere Bagatelle compared with what was to come. The opening movement was akin to a ballet on ice as, strangely, the sand-dressed pitch had been given a pre-match watering. Swan Lake it was not. Perhaps for those who lost their footing the Nutcracker was more appropriate. A recurring theme throughout this movement was that of Madame Butterfly. The Eurocrat Bureaucrat floated like a butterfly and stung like a bee. She was even in action before the match got underway. Although LX White’s sticks all passed The Ring audition, Mike Gale’s instrument was deemed to have a bow that was a millimetre too large. She explained that this gave skilful players an added advantage when flicking. When informed that Mike was neither skilful, nor could he flick, she relented. Thank goodness she didn’t test Tony Jones’ legs! Then naughty schoolboys Young and George were scolded for leaving their seats to look for a ball that had cleared to fence and gone into the bushes and mistress Lesley Martin was reprimanded for sitting in the wrong seat. There was further consternation with apparent inconsistency in the White’s numbering, particularly David Gill’s 69. “Vot is zees soixante neuf, I do not understand?” Over to David…..! And so to the second movement - the allegro -fast and furious. Enter Mars, the god of war. Like the Martians in The War of the Worlds, “still they (LX Red) come… still they come.” How LX White survived the invasion remains a mystery, suffice to say an explanation might be provided by the Enigma Variations – LX Red must have had a dozen penalty corners, but there were so many variations that they were a complete enigma. A more tangible reason was some stalwart defence, desperate at times, and Nigel Dixon’s superb goalkeeping. Thus came the interval with the score still 0-0. Following interval drinks (much needed water) and the introduction of some fresh LX White legs, the third movement was an adagio – restful and at ease. It was a Pastoral passage during which LX White, having survived the storm, slowly got back into the game. The fourth and final movement was pure 1812, complete with cannon, mortar and fireworks. The tide began to turn and it was now LX White who surged forward. And so to the finale. A penalty corner. Rod Cochrane injects to Graham Martin, who slips to Chris Jones. The pass back to Rod is inch-perfect and is swept unerringly into the LX Red net. Cacophony! LX White march triumphantly into the LX Red capital, guns blazing and trumpets sounding. LX Red took their defeat magnanimously and the teams would have shared a well-earned drink had it not been for the kitty men heading off in opposite directions due to the difference between ‘tent’ and ‘shed’ being lost in translation. Oxford 2012 was underway. The day began badly. Where was the Big Red Bus to take us to the Dragon School? Were the wheels on the bus still going round and round, round and round, following the previous day’s puncture? Fortunately the situation was saved by some LX cars that had been parked nearby. After the previous day’s classic symphony, this was more like the Eurovision Song contest. LX got off to a lethargic start, with the Dutch playing with us like a Puppet on a String. The only real excitement in the first half was Rod Cochrane’s ability to defy the laws of Physics. This is not generally the case as he normally gravitates to earth with the greatest of ease. On this occasion, however, he apparently managed to transform matter (i.e. the ball) into a wave, which passed though the Dutch goalkeeper’s body, and then transformed back into a particle that magically re-appeared in the top of the net. Although this is actually a well-known phenomenon of quantum mechanics, called the de Broglie wave-particle theory, it has yet to be observed on a hockey pitch. The decision not to award what was a clear goal was made by the far umpire some 50 metres away, who was unanimously awarded nil points by the jury on the bench. LX gradually improved in the second half. Austyn Leaverland burst through two defenders and as he was poised to shoot he was unceremoniously clattered to the ground. Yellow card – yes! Penalty flick – no! Just a short corner! Another nil points decision. LX efforts were eventually rewarded when Rod reverse- flicked home from close range, much to everyone’s relief. Game over. Well, not quite. There was more drama yet to come when the Dutch were awarded a penalty corner just as the hooter sounded. Fortunately nothing came of it and LX breathed a deep sigh of relief. Two wins in two days. Congratulations! Skipper Graham Martin’s pre-match team talk mainly revolved around whether this was the better of the two Australian teams. The confusion was undoubted exacerbated by the fact that they were called Red and Blue and both played in green. The best part of the match was the conviviality of the post-match beers, during which the Aussies gave the man-of-the match award to Nigel Dixon, who proved to be the thorn in their side by thwarting so many of their goal-bound efforts. For the record, the LX goals were scored by the skipper, with a well struck shot when he found himself in space following a penalty corner, and the evergreen Rod from close range following a goal-mouth scramble. A match to forget (which is probably why your scribe can’t really remember much of what happened!) but, to be positive, we were still unbeaten. As the Aussie Blues had beaten the Aussie Reds and drawn with the Dutch we knew this was going to be a tough one in the mid day sun, with the temperature soaring to 30°C at the Dragon School. LX were determined to put the previous day’s disappointment behind them and came out with all guns blazing. With Andy Barnes coming in to add weight to the defence and Chris Jones and Austyn Leaverland dominant on the right, new LX member Peter Curtis was able to find space down the right wing, which he used to great effect. After less than 5 minutes he centred into the circle and a loose ball was swept home by Graham George cutting in from the left wing. More, and better, was to come. Following a flowing passage of play, a well-struck cross was met by GG at the top of the circle. In one movement he controlled the ball, turned the defender and clipped the ball into the right-hand corner, much to the consternation of the Aussies (and, dare I say it, the amazement of his team-mates!). Two up in less than 10 minutes and more to follow, with the other Graham (Captain Martin) adding a third with a powerful shot in the second quarter to give LX a 3-0 lead at half time. This was, without doubt, LX’s best hockey of the tournament and completely deflated the Aussies. LX added a fourth in the third quarter through the irrepressible Rod (to make his tally a goal -a -game), after which the match petered out, with both sides waiting for the final hooter to signal time for beers all round. Unfortunately, whilst LX went back to the Hawks Club the Aussies retreated to the nearby Cherwell Boat House, where David Gill generously bought a round for them! LX White were now the only unbeaten team, topping the league table with 10 points. With other results going in their favour, they were definitely in the final and so this became a ‘dead rubber’. Although LX were determined to win in order to keep their momentum going, it was not to be and they were simply unable to reproduce their earlier form. 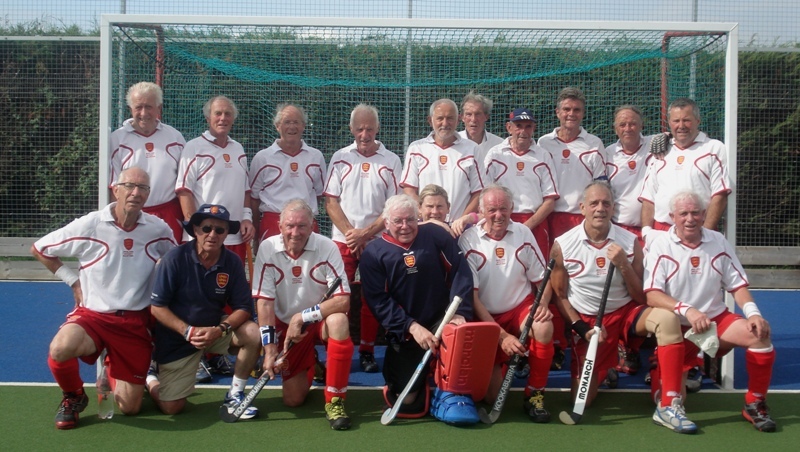 A much improved Alliance side played the more positive hockey and their display more than warranted a draw. LX did take the lead with a good shot by Andy Barnes from a penalty corner, but they could not capitalise on it. The Alliance’s purposeful play was justly rewarded when they equalised from an even better strike. Honours even. With LX Red only drawing, somewhat fortunately, with Southern Cross Blue, LX White finished top of the table by three clear points. And so to finals day, which kicked off at 09.00 with the all-LX 65 Tournament Trophy as a curtain raiser for the three International finals. This match was the mirror image of the initial encounter, with LX Red now at full strength and LX White missing players who had other commitments or were carrying injuries. In the end, the younger and fitter legs of the Reds carried them home, albeit with a fair measure skill as well! As in the first match, LX Red dominated much of the play without creating any really clear cut chances. LX White looked dangerous on the break, with some telling runs from Rod Cochrane. After one such effort, his superb cross on the run could not quite be converted by Graham George. Following another marauding run, Rod’s first shot was thwarted by Keeper Kimber and the rebound was saved on the line by a defender. Half-time 0-0. LX Red continued to press in the second half and it wasn’t long before they took the lead. Following good work by LX Red down their right wing, the LX White defence was sucked in, leaving John Ridings unmarked in the centre. He calmly drew the keeper before passing, unselfishly, to Adrian Stevenson coming in from the left. Needless to say Adrian did not miss! With LX White having to push up in search of an equaliser, LX Red added a second, somewhat fortuitously. Tony Jones was penalised for not retreating 5 metres when LX took a quick self-hit from the wrong place. Roger Lomas’ penalty corner shot struck an LX White stick and ricocheted into the top of the net past a hapless (and obstructed?) Nigel Dixon. However, the Whites couldn’t complain as they were well beaten by the better team on the day. The match was played in fine spirit, competitively, but without a ‘card’ in sight, a fact commented on by the umpires. This was a great advertisement for LX hockey. Well played everyone! Apart from those already mentioned in dispatches, new members Allan Sutton and Geoff Gosling proved to be valuable assets to the club. Allan was a rock at the back with Doug Barnes, whilst Geoff ran his socks off in midfield. Bob Grenside showed glimpses of his dribbling skills and Ian Wilson, who didn’t get much pitch time, nevertheless hurried and scurried and gallantly played his part in the team effort. With thanks to the Martins - Captain Graham and Manager Lesley - for their organisation, not least in their restaurant arrangements, and to Vice Captain (and warm-up man) Mike Gale. Not forgetting, of course, Bob, Richard, Roger and Adrian for their amazing effort in putting on the whole show. You did it! The records will show that in this years World Cup competition in Oxford, England were the team with the goals but the all important goal was scored by the Australians in the play off for gold and silver. With 6 countries entering as opposed to only 3 in the previous world cup, it was going to require stamina as well as skill if England were going to retain the title they won in Cape Town 2 years ago. The opening match of the campaign saw England v. Japan resulting in an 11-0 victory for England. Next came Holland and England began in much the same style as they had finished against the Japanese, except for the goals. With the half time score at 0-0, England changed the game plan and were immediately on the defensive. Holland seized the initiative and took the lead. Fighting to recover the situation England finally got an equaliser in the last minute following a penalty corner. With a league system in place, it was important to ensure a top 2 position be certain of a place in the final play off. Next opponents were Australia, eager to get one over the ‘poms’. Surviving the early England pressure the Aussies took the lead from a penalty corner but England were deservedly back on terms before half time. Neither side were able to break the deadlock and another draw was recorded So far, so good. Australia had been fortunate to beat Germany on day one but had only lost 3 points as opposed to Englands 4, having drawn twice! England soon moved ahead Germany with a goal after 11 minutes and the Germans never recovered from a second goal just before half time. Still needing to win the last game against South Africa to be certain of second spot, England warmed to their task and scoring steadily ran out 9-0 winners. And so to the final game. After a slow start, England moved on to the attack but could not make the final breakthrough in spite of a series of penalty corners. With 20 minutes left Australia took the lead from a penalty corner and were then able to play out time, denying England possession, taking the gold medal and leaving England with the silver. England’s first game was against unknown opposition from Japan. After a nervy start Mike Surridge scored from an oblique angle. Greg Hutchings added to our lead in the 14th minute which brought on a storm of thunder and lightning of such magnitude the game was halted for half an hour. When play was resumed the same two players scored again making it 4-0 at half time. The second half was played in a similar fashion to the first with Mike Surridge completing his hat trick, Imtiaz scoring from close range and Barry Mills scoring from a short corner. The Japanese never stopped running and their enthusiasm augers well for their future in Masters Hockey. A 9am start was not what we wanted and the folly of not staying locally as a team was soon exposed. Long car journeys meant some players were jaded before the start. The Welsh packed their defence with 10 players and despite their lack of ambition nearly scored first after a rare breakaway. Eventually Neil Major broke the deadlock from a short corner tap in. Lloyd Wood then added a couple more to make it 3-0 at half time. England were still not playing the crisp attacking hockey they are capable of and whilst scoring another four goals through Barry Mills (two short corners), John Maylam and Greg Hutchings from open play the Welsh were allowed to score when McCombe ( The Scottish Welshman) rounded the keeper after some sloppy defending. This was a game England will want to forget. After a series of fast moving attacks against a disjointed defence the Germans were awarded a series of penalty corners from which they scored a goal after blocking the keeper. Though out the game England could not string two passes together and were fortunate to equalise through Mike Surridge in the final quarter. Even then only the timely intervention of the keeper rushing out to the 25 to clear the ball prevented another German score. England started this game as if their collective lives depended on it. Fast attacking moves down the right and injections of pace in the midfield. After 9 minutes this continuous pressure resulted in a short corner which Barry Mills duly converted. Try as they could they did not increase their lead and only the solid goal keeping of Paddy Maher kept the score to 1-0 at half time. In the second half England peppered the Australian goal only to be denied by the brilliance of their keeper and then disaster struck with England giving away another sloppy goal. Eventually the lead was restored when a well-orchestrated short corner routine was tucked away by Neil Major at the near post after a probing pass from Greg Hutchings. This spurred the Australians into all-out attack and only some timely saves and clearances by the English defence meant when the final whistle game England had secured, rather tortuously, maximum points from the game. A draw would be enough to see England into the final but pride meant only a win would suffice. The Dutch played some fast attractive hockey displaying skills of a very high level and only good work by the defence kept the score to 0-0 at half time. The England forward line was again struggling to put two passes together but immediately after the break Lloyd Wood rounded the keeper and shot for goal only to be denied by the feet of the Dutch centre back. A stroke was awarded and tucked away by Brian Perryman. This spurred the Dutch into a period of attractive hockey only to be thwarted by some brilliant goal keeping and a defence that refused to yield. Imtiaz then poached a goal after the Dutch had become exposed in defence pressing for the equaliser they needed to reach the final. Eventually England succumbed to the continuous pressure and tired legs allowed the Dutch centre forward to pull one back with a rasping shot into the roof of the net. Playing in a final watched by a large vocal crowd meant England had to put on a show to thrill the neutrals and reward the England supporters who had cheered their team on throughout the tournament. They would not be disappointed. England started at a pace and skill level not seen in previous games with all their previous nerves and anxieties just a fading memory. Greg Hutchings opened the scoring with a clever short corner move which was doubled when Brian Perryman converted a stroke after Lloyd Wood’s shot had been saved on the line by a German foot. Germany pulled one back at a short corner which crept in under the keeper’s body in the 18th minute of the first quarter. This setback simply spurred England on to greater efforts only to see shot after shot saved by the German keeper, go narrowly wide or in the case of some players missing open goals. 2-1 at half time. The second half started at a an even quicker pace and with the Germans reeling on tired legs they were powerless to stop Imtiaz scoring with a rasping reverse stick strike which rocketed into the net. It was now show boating time with England passing the ball skilfully around using up time until the final whistle with the opposition becoming more and more frustrated as they were denied the possession that might get them back into the game. At the final whistle the team was greeted with applause by the crowd who had been treated to a display of fast attacking hockey. A result only made possible by an ethos of hard work and commitment by the players which, combined with the backup support of coach, skipper, manager, physio and not forgetting the wives, resulted in the reward of the richly deserved Gold Medal.